[Park Sang-seek] Is Korea really “Hell Joseon”? The Dec. 11, 2017 edition of The Korea Herald carried an article titled “Why Koreans want to leave ‘Hell Joseon’.” According to the article, 62.7 percent of people polled in December last year regarded South Korea as “Hell Joseon.” Fifty-six percent were willing to give up their nationality. The desire to leave Korea is more prevalent among the young generation, many of whom struggle to find employment. The main reasons for the Hell Joseon mentality are that Korean society is unfair and corrupt. Korean society is unfair mainly because the privileged and their children and relatives enjoy better jobs and more wealth. Koreans are less concerned about the income gap between rich and poor than income, or job, insecurity. In terms of income inequality, South Korea ranks approximately between European welfare states on the one hand and East European and Latin American states on the other. According to a 2015 survey conducted by Statistics Korea, more than 61 percent of respondents felt insecure about their job status. In terms of the Gini coefficient 2015 as a measure of income gap, South Korea ranked No. 24 and the US No. 4 among 37 Organization for Economic Cooperation and Development member states. This means that wealth inequality is much greater in America than in Korea. But South Koreans feel much less happy than Americans in general. Why? Americans have not, for the most part, abandoned the “American dream” -- a belief that everybody has an equal chance to become rich and succeed -- but Koreans have no “Korean dream.” Most people here do not believe that everybody has equal chance to success mainly because Korean society is corrupt and equal opportunity is nonexistent. To make matters worse, Koreans suffer constant competition to get admitted into a prestigious university and obtain a well-paid, secure and quickly promoting job. The social atmosphere itself is so stressful that it pushes people to compare themselves to others and compete for better pay, a better house and better education for their children. According to a poll by Macromill Embrai in 2015, 76.6 percent of Koreans wanted to live in a country where they could be more relaxed, while 61.7 percent wanted to get out of the fiercely competitive society. This anxiety of the people has resulted into two unfortunate outcomes: suicide and depression. According to OECD Health Data from 2015, South Korea had the highest rate of suicide (33.5 people per 100,000) and Greece the lowest rate (3.2 per 100,000) among OECD members. In another survey conducted by the Korean Center for Disease Control in 2015, 5.35 million (13 percent) of 41.2 million adults suffer depression here. Of course, the causes of depression include both mental and physical ones. But if we consider that a majority of the patients of depression are found in the young (20s) and old (80s), and mental causes are more prevalent than physical as far as South Korea is concerned, we can conclude that the characteristics of Korean society and culture are more relevant to the high suicide and depression rates in Korea. We have found the causes of unhappiness and mental diseases lie in the characteristics of Korean society. Why are Koreans unhappy about their society? Korean society is in transition from a typical authoritarian Confucian society to a rapidly modernizing and westernizing society. Newly developed non-Western countries go through a painful process of cultural transformation. Oriental civilization sharply contrasts agaisnt Western civilization. In Korea, traditional cultural values such as authoritarianism, collectivism and what Talcott Parsons called pattern variables such as ascription and affectivity values are being challenged and replaced by individualism, freedom, equality, achievement and affectivity neutrality. Young people are more willing to accommodate these values. This is one of the reasons the young generation is more liberal and the old more conservative. Those of older generations who are conservative are still in control of Korean society and consciously and unconsciously try to preserve old cultural values. Unfortunately, the North Korea factor hinders the cultural renaissance of South Korea. Older Koreans who are conservative and extremely hostile to North Korea tend to prefer old cultural values to new ones. How can we accelerate the transformation of old Korean behavioral patterns into new ones? The successive governments committed themselves to a rapid and smooth transformation of Korean society into a civilized one. However, their “moral rearmament movements” did not go beyond mere oral sloganeering. Koreans should start a nationwide movement to transform Korean society into a civilized society and escape an anomic society as soon as possible, as they have succeeded in building a democratic political system through blood and tears. Democracy cannot be rooted firmly in an anomic society, and can last long only in a civilized society. 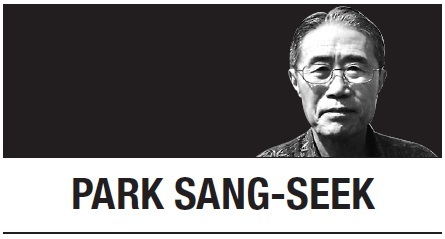 Park Sang-seek is a former head of the Institute of Foreign Affairs and National Security (now Diplomatic Academy), Foreign Ministry and a former rector at the Graduate Institute of Peace Studies, Kyung Hee University. He is the author of “Globalized Korea and Localized Globe.” -- Ed.